This lightweight easel has a brushed aluminum finish. It is intended for display purposes. Legs are adjustable allowing for conversion to a table top size. It also comes with a zip-up bag for transportation convenience. 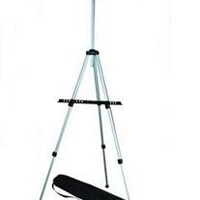 This easel can double as a studio or field easel but it is not recommended for large or heavy works.